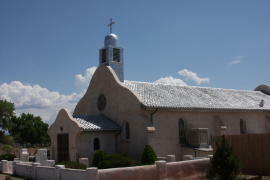 The Village of Corrales is a small, treasured oasis located alongside the fast-growing Albuquerque metropolitan area. While the greater metropolitan area numbers well over a half million people, Corrales, about 9,000 in population, aggressively strives to retain a rural lifestyle. Prehistoric sites indicate the Corrales Valley was occupied as early as 500 A. D. when ancestors of the present day pueblo Indians inhabited the area. Subsequent populations, including Hispanic, European and American families, settled here to raise grapes, apples, and livestock. That tradition continues today with our wineries, many farms growing a vast array of fruits and vegetables available at our Growers Market and a wide variety of livestock living in the Village. To cross the borders into Corrales is to step into another time and place where the stresses of twenty-first century life give way to the grace and pace of another era. Casa San Ysidro, a restoration/recreation of an adobe home built in the 1870’s provides you with a glimpse of life in old New Mexico. Directly across the street from Casa San Ysidro, sits the Old Church. 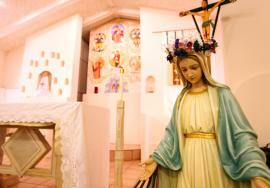 Once the home the San Ysidro parish, it has taken on a new life as a home for art fairs, concerts, special events, and occasional weddings. Adobe architecture, so well represented in the old church, can be seen in the homes and businesses throughout the Village. Corrales may be a small village but it is alive with galleries to explore, unique retail establishments with one-of -a kind merchandise, restaurants featuring a variety of food for all tastes and miles of tree lined trails to explore. Our popular festivals and events including the annual Garden Tour, Corrales Art Studio Tour, the Harvest Festival, Scarecrow festival and Starlight Parade provide you with a chance to experience the best Corrales has to offer. At the end of your day check into one of our welcoming bed and breakfasts that will allow you to experience first hand the gentle life in this special Village. To visit Corrales to experience true New Mexico!